My May Day Swap socks are done! Except the grafting. The yarn is BMFA Sapphire in Heavyweight. Perfect Spring morning socks, when there is still a bit of a chill in the air. or if you live here, great for when it is dumping snow in late April. Here is hoping my pal will like these and that they fit! There was much gnashing of teeth and ripping back in terms of fit. Each time I knit a pair of socks, I find that I internalize another piece of the sock puzzle which is completely invigorating. One of the actions which I find truly energizing(regardless of the item) is ripping out and reknitting it. Which not only did I have to do that several times on the above socks but on these too. Must finish giant socks! Camp was wonderful. It was much harder this year to be away from the boys, though we all have pulled through in fine form. I find that I want to tell you more about camp and as it is incredibly experiential for me, this is proving difficult. Great fun is apt but not terribly descriptive. It was great fun all the same. Duncan is home with a fever and whine today, so lots of knitting whilst wiping of a little nose (not with the knitting!) and giving comfort. My Mom was tickled that her photo popped up on the blog AND she gave me permission to tell her age. It is going to be a contest! Guess my mom’s age, on the nose- it is a milestone birthday- and you will receive 1 skein of Blue Moon Knitters Without Borders in Lightweight (not yet available on their site), plus one more skein of Blue Moon Yarn (weight & color tbd by winner’s preference) and other various goodies. Leave a comment by Noon, PST Friday May 2. And if you know shh…..Also, if there is more than one correct guess, we will do the name in the hat thing. One guess per customer.Good luck! Now that I can see what fun sock camp is, I SO want to go next year! Hmmm, I think your mother is turning 60. Or… I could be completely wrong. My guess is that your mom is turning 65 only because that’s such a big milestone and because *you* don’t look your age either, and I’m thinking you come by it honestly! But she looks like she had you when she was about 12….Totally. It’s snowing TODAY in southwestern Wisconsin. Grrr. It’s almost May, and the last frost day is usually about now. This winter just won’t go away. Miss you, m’dear! I loved meeting you at camp! Hey, I have a contest coming up tomorrow, and one of the prizes is remarkably similar! Hope small Mr. is feeling better soon. She has to be 21! Hey, I wanna see your sock monkey! Congrats on finishing the socks! They look great! I can’t guess as I know the answer! Bummer! Just thinking about you and started browsing around. Miss you. Had no idea you are an incredible quilted besides an incredible knitter! Wow! Give Angus & Duncan a hug & a love for me. I think she is turning 70 – though if I hadn’t read the build-up, I would have guessed 60! i’m guessing 65. your socks look absolutely lovely. well done! As you mentioned “milestones” I am going to go with 60. Oh my, that picture of Mom is waaaaaaay back there! She’s beautiful and you look so much alike! I guess 65 because she doesn’t look that old! 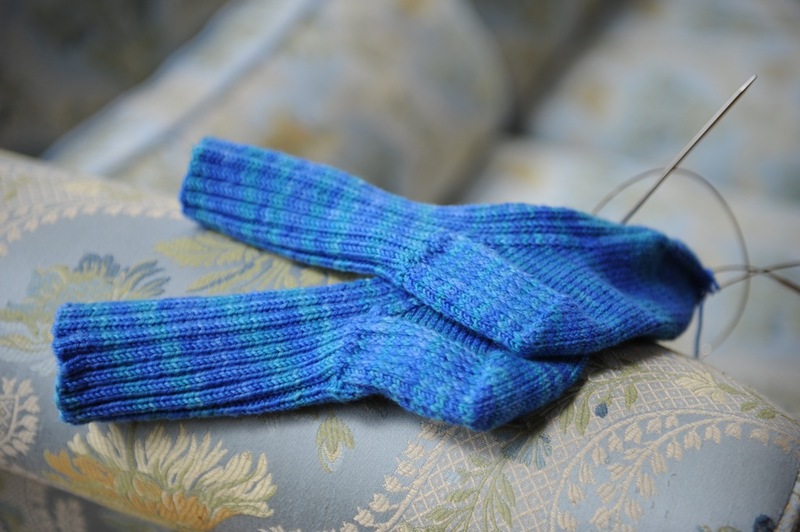 Your MayDay socks are lovely and so snuggly – and yes – the sock monkey. Must See. Hmmm – my guess is 61.